I work on all sorts of questions, from how animals behave and evolve to how ecosystems are managed. Most of my research focuses on trout, salmon, their habitat and management. I decided to work on salmonids because they are interesting, they matter, and I like being in the places they live. Check the Outreach tab to find out more about some of my applied work. Below are brief descriptions of a few research topics and the systems used to tackle them. Some topics/systems are old favourites, some are new and active, and some are just getting started. You can browse through the Publications tab to find out more. I am always looking to do science that matters. 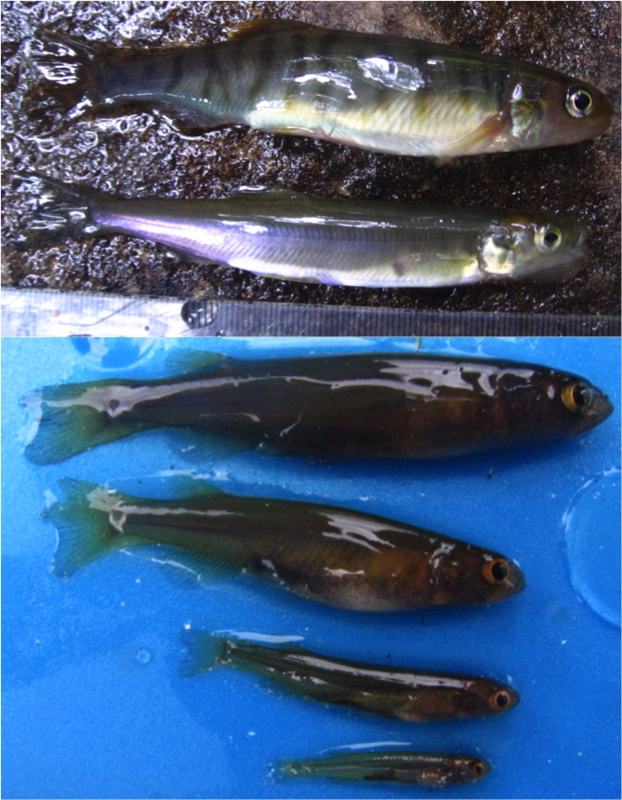 I have studied the effects of riparian zone management on stream ecosystems, the effects of salmon stocking on fish and anglers and the effects of lake eutrophication on fishes. On the left is Jeff McKinnon and Ric Taylor’s wonderful cartoon showing how eutrophication drives extinction through hybridisation in a whitefish species pair in the Swiss Alps. Recently, I worked with Scottish government to develop scientific collaborations through which stakeholders can address issues related to salmon aquaculture. I am currently working with government agencies and salmon fishery managers in the UK and Ireland to experimentally explore alternatives to stocking hatchery fish. How competition affects individuals and communities is one of my favourite topics. For example, how does body size affect competitive behaviour? Do pairwise competitive interactions scale up to predict community structure? How do competitive interactions at one trophic level affect other trophic levels? I often use simple stream dwelling salmonid communities. They are great because you can manipulate relevant variables in lab and field experiments, then relate your results to the (vast!) literature on how populations and communities are structured in the wild. More recently I have started using invasive crayfish, a system ripe for experiments exploring how invasive species and habitat degradation interact to affect ecosystems. 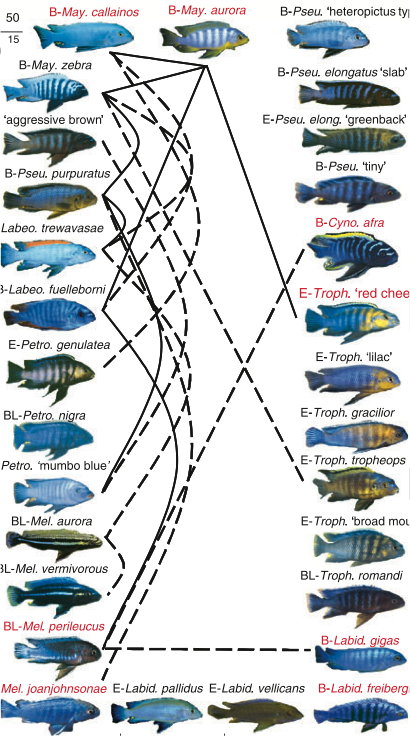 I also use the famously species rich rock cichlids of Lake Malawi to explore how male traits like body colour affects competitive interactions and community structure during adaptive radiation (complexity evidenced by silly figure of interaction coefficients to left). How do females choose males? Do females that have assessed more males lay more eggs when they finally decide to mate? How does male-male competition affect those choices? I use bower-building cichlids (B-cartoon of a sand castle bower) from Lake Malawi to explore how male competition and female mate choice interact to drive the formation of breeding leks (A-map of male territories on a breeding lek ). Having developed field and analytical methods, I am now exploring new questions, including why multi-species leks are so common in this system. There are countless questions and bower-building cichlids are in many ways the perfect system to answer them. How does biological diversity arise? What are the roles of ‘ecological opportunity’ and ‘niche specialisation’ in driving speciation and adaptive radiation? How are patterns of morphological diversity distributed across different radiations? I use African cichlids and post-glacial fishes to study adaptive radiation and speciation. 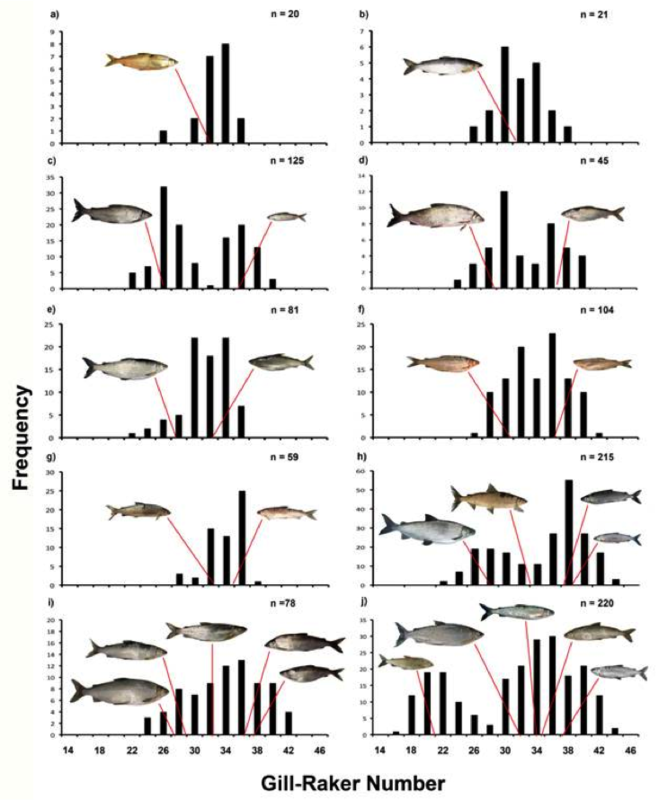 Both model systems are well suited for comparative approaches, as evidenced by Pascal Vonlanthen’s figure comparing gill raker diversity from white fish radiations varying in species richness. How do invasive species interact with ecologically similar native species? How do these interactions affect other trophic levels in the receiving ecosystem? What role does habitat degradation play? My work on invasion ecology started while studying the impacts of salmonid aquaculture on native biodiversity in Chile (see project site here). In Chile a raft of wonderful and horrible, established and new non-native salmonids threaten native fishes (three favourites to the left-the reddish ones are actually tiny). I have also started using invasive crayfish and European eels in the UK.